For those looking to add a taste of adventure to a Myanmar tour, these guided soft trek tours are a great introduction to the culture and scenery of the Shan States. Walking from village to village through spectacular highland scenery, you’ll be presented with stunning views and exceptional cultural encounters. Myanmar Shalom Travels use less touristy trekking route to give you real authentic trekking experience. We only do private trekking and not with the group. We have excellent trekking guide who is friendly, well experience and very good cook. The lodging that you will be staying is clean, safe and nice environment. We are trying to improve the education system of the children at some of those villages that we use as trekking route and support some primary schools in that area. You will be able to witness some of those along the trek. Depart from Kalaw in the morning about 8:00 and after 2 & 1/2 hours walking distance, through small ranges with tea-leaf and cheroot-leaf plantations, approach to Ywar Thit village to meet local villagers Danu people. Then proceed to Tar Yaw village of Palaung people. TarYaw village is reputed for its long houses of old style Palaung tribe. The long houses have six or eight Palaung families stay together. In the house, hand-made weaving can be seen. Proceed to view point with a small shop for picked lunch. Enjoy beautiful sceneries and panorama from view point. Total trekking hours are about 5 hrs for the whole day. Pick up at the Nyung Shwe or Inle Lake Hotel. Drive to trekking point in Nyung Shwe (about 10 minutes. Start the 5 hour trek from there -walking through small ranges with tea-leaf and cheroot-leaf and coffee plantations – walking from village to village through spectacular highland scenery, you’ll be presented with stunning views and exceptional cultural encounters. After 2 & 1/2 hours you will approach to Khong Soin village. You will visit village school. There are about 100 students and you will have opportunity to meet with them. From the school, you will see the whole area of beautiful Inle Lake. Breakfast at the village and we will start trekking around 2 hours. You will visit some schools and monastery at villages along the trek. Then you will reach to the beautiful waterfall. We will spend about an hour in this beautiful area. Then proceed to pass by a typical Danu, Taung Yoe tribe villages. The people in these villages are well known for their bamboo mattresses and handicrafts. Lunch at Indein village and transfer to your hotel by boat. From Heho airport or hotel in Kalaw transfer to trekking point. The road and trail goes through beautiful scenery. 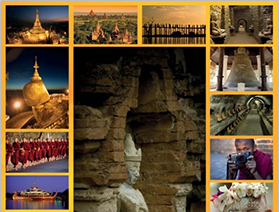 On the way visit the villages of Palaung, Danu, Pao and Taung Yoe. Your local station tour guide will introduce you to the villagers and will show you the traditional ways of life. Lunch in a Palaung village. The path goes up and down. Native along the way do the plantation for Tea leaves, Coffee, Cordial leaves, Mustard, Ginger, Malt Rice, Cabbage, Cauliflower, Sesame. Late afternoon you will arrive to Shabin a typical Danu village. Dinner and overnight in the village. After your breakfast continue your trekking trip. It is about 6 hours trekking. The people in this area grow fruits; Avocado, Banana, Oranges, Jack fruits, Papaya. You will have the chance to see the crab apple trees along the way together with some shady Banyan trees. Lunch at Pawke a Pao village. After lunch you have to walk for another 3½ hours to Teetain a typical Pao village. Native along this way do the plantation especially for Ginger. Dinner and overnight in the village. After breakfast continue the 5 hours trekking trip to the shore of the Inle lake. The trail goes through beautiful scenery of Bamboo forest. Lunch at lower Thandaung village. In the afternoon transfer by boat to your hotel. Rest of the day free at your own leisure. You may combine or add this trekking with other packages. This private trekking can be arranged for single traveler, couple, family and group tour. Please contact us to discuss your individual requirements.